We Indians always yearn for better ideas to emerge from our innovators that are affordable and adaptable our local needs. Despite all the talk about environmentally-friendly living, it seems like all the good green ideas are originating from the West! Thankfully, there is a growing list of simple yet innovative ideas that are not only eco-friendly, but also are economical. 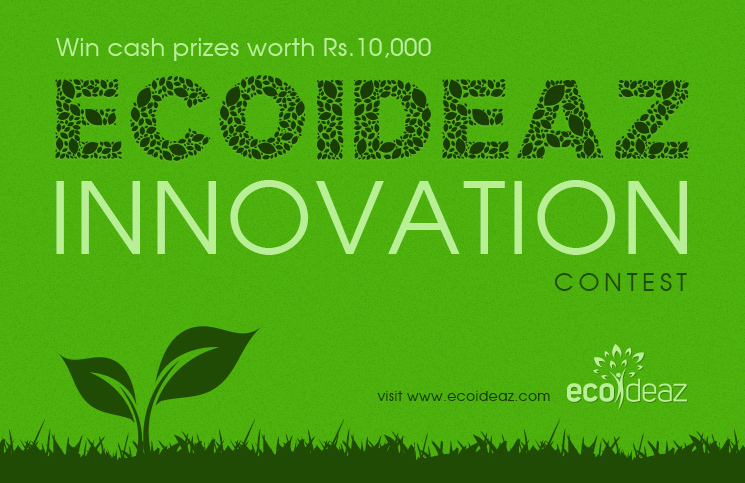 We are organizing the ‘Ecoideaz Innovation Contest’ where we seek your nominations to recognize the best innovative green idea seen in India. The primary criteria will be the eco-friendliness of the idea and its commercial feasibility. We request our readers to identify the most eco-friendly product or service created in India either by writing a case-study on it or by just nominating it with a brief description. Remember, the idea need not be implemented by you! Participants have to just identify the most popular and unique eco-friendly idea created in India. If the idea is not featured on our site, you can add a new idea along with its photograph searched online. Judges will select the best idea based on both popular votes from readers and votes from a panel of eminent ecologists. Write a short case-study on the most innovative eco-friendly product or service created in India. Write an original article in a range of 500-700 words. Copied content will be rejected, but you can quote relevant sources in your footnotes. It would be great if you have pictures of the idea. You can also send web images taken by others (Flickr, Facebook, etc), but obtain written permission from them. Judges have the right to reject articles or images that do not fit in with our editorial policy. Each of these case-studies will be published on Ecoideaz and will be voted by our readers. Participants can promote their ideas among friends and get more votes. Judges will select the best case-study based on both popular votes from readers and votes from a panel of eminent ecologists. All the articles and images sent to Ecoideaz will become our property, which will be published with proper credentials of the copyright holder. The last date for submission is extended to 5 June and prizes will be declared on 15 August! OR Use below form to send your innovation details. We are starting commercial production of Edible Cutlery an eco friendly, biodegradable cutlery in Hyderabad by end of June and are looking for direct online sale. Please do check our website for further details and contact us for all inquiries soon. It seems you have not referred our website http://www.bakeys.com before making a comment on our cutlery. It is NOT EDIBLE PLASTIC as interpreted by you or understood by you. It is EDIBLE CUTLERY- Cutlery that one can eat after the meal. Please read the website carefully. It is made of sorghum (Jowar) and other grain flours. There is no plastic whatsoever in this. It is a baked item. You will get all the information about why I innovated this product. It surprises me how one responsible like you would miss out on website information and have not even tried to cross check on google search. If interested, please write having gone through the website and my research work and research papers on google. We get a lotafull (nearly one liter) hot water at our water tap in the noon. I was astonished when I confirmed that this tropical experience has not been converted in Technology. I accepted the challenge & got it done. This is Gravity Solar Water Heater. This is a fixed temperature SWHS & contains two innovations. 1) Water bed Collector with 36 rectangular risers; a modern technology used in Automobile Industry for engine cooling radiators. 2) ‘Forced flow Circulation’ under Gravity force. Presently big industrial clients are offered with a set of’Forced flow circulation’ systems with Electrical installation, pump, sensors, transmitters, solenoid valves & control panels. This is a costly affair & clients affording SWHS systems above 4000 or 5000 LPD can avail such technology. Gravity SWHS replace electrical energy with free Gravity force & a low cost, sturdy, mechanically operated single ‘Control Unit’ takes care of all other equipments. Thus we offer Forced Flow Circulation’ benefits (3 to 4 times more solar Heat) even for a single or multiple panel clients. AnaNaFit is the first of its kind to produce eco friendly natural fiber textiles from banana fiber which is an agricultural waste, which otherwise will pollute the environment. Any organic or agricultural waste if disposed improperly it would emit methane which is 23 times hazardous than carbon dioxide. In the Indian agricultural practice safe disposal it is not really happening because of the cost, time involved and for the other secondary reasons. They being a traditional handloom weaver innovated a process of extracting fiber from banana stem and yarn it and weave it to a apparel. The process is completely manual and no machinery is involved at any stage of the production. The color dyes used are natural vegetable dyes. These eco friendly natural fiber textiles have a great demand and get huge orders without even promoting and the products are well accepted and hailed from the customers. This project has a multi dimension benefit. It pays the additional income to the farmer for the waste given to us which otherwise he would need to spend time and money to dispose. The next beneficiary is the handloom weavers who suffer a huge internal and external competition from their community and the large scale mills, putting them into the problems to sale their traditional weaved products. The innovative eco friendly products helps them not to worry about the market and sales as it is readily available which is ready to pay the better price. Next is the customer who is going to benefited by getting a value added product and eco friendly product for the price he pays. Finally is the environment that is benefited by using the waste as a raw material which reduces the demand of the traditional cotton can be brought down and increase the yield of food grains that would bring down the food crisis and prices and even the inflation down with the high food grains production. Cotton is grown only to cater the needs of textiles. If our textiles needs are fulfilled by the raw material which waste in the other sector we can use the land for the growth of food crops. I would really like to talk to you about the production process of the banana fibre. Unfortunately the only email address I found doesn’t seem to work. Is your company currently still working with banana fibre? To manage waste volume at apartment level, we have designed a semi-automatic baling machine to reduce the volume of waste. This can be easily managed by single person. It helps with neatly staking the collected waste into blocks reducing space requirement and helps with better waste management. This can be part of solution along with organic waste composter. Its a common sight: Women carrying water filled ‘matka’ on her head! She has been carrying water on her head for long distance, for her life. A typical vessel can carry 5-10 liters of water. Typical distance traveled is 5-8 kilometers. But is 5-10 liter for a household enough? Every household needs about nearly 20 liters water per day to stay dehydrated and be healthy, forget about water for other needs (1). Imagine the plight of the women and people in dry and parched summers of Rajasthan and Gujarat. This is extremely exhausting and painful. She loses precious time; the time to spend with her kids and support her family. Also, the kids of the family are supporting her. This is the plight of our people in rural India where the accessibility to water is a question? We need to solve this avoidable problem, improving their health conditions and fulfilling their basic human need. What can be done? A social venture Wello came to India in September 2011 with an aim to provide innovative solution to water availability and accessibility. Their motto was: provide easy and healthy water to masses. They came up with the idea of rolling pin: The WaterWheel 2.0. It looks amazing. A round football connected to a pulley. One WaterWheel can carry 50 Liters of water in a go. The container is closed and will help in transferring clean and hygienic water. It can be pulled around and can transport water with less effort. It is affordable and can be made available to masses. Wello is aiming to launch it locally at Ahmedabad city in Gujarat and extend the concept to bring water for small scale husbandry and irrigation. To me, it doesn’t need much introduction and description, the concept speaks on its own. I am researcher and admire the concept. I am advocating this concept, for its innovation, its re-usability and greenness, its customized and people-centered design, its affordability and social impact. I hope this concept gets popularized and we see a revolution in our rural India: Women with WaterWheel. Sorry to disturb you , I have checked your web, find most of bamboo clothed is our facoty mainly producting , and we have major weaving all kinds of bamboo fabric for baby clothes and beding for more than 7 years , and I am helen, the little boss of tangdynasty textile , do you need some free samples to check ,or give you some price to check , you know the bamboo fabric is lower price than cotton , and have very good handfeel , and also been called second skin of baby,sorry for disturb you ,if yes , ples tell me .i will not sent to you again . Best wish to you . http://www.Grow-Trees.com is a social enterprise launched and dedicated to the Planet on World Environment Day, June 5, 2010. It aims to inculcate the practice amongst companies and individuals worldwide to plant trees in public lands through the web and dedicate the trees to greet or honour someone by means of an e-certificate with a personalized message. Over 738,000 trees have been planted through http://www.grow-trees.com so far; the plantings are audited by accounting firms as well as through own site inspections. These trees will provide flowers, fruit, fodder and fuel to rural communities and living creatures, improve water catchment areas, and benefit posterity while decarbonising the world. We are the official planting partner for United Nation’s Environment Program’s (UNEP) Billion Tree campaign and United Nations Decade on Biodiversity (UNDB) and were also the official partner of WWF’s Cities for Forest Campaign. The trees are planted only on government or community land so that they can benefit the maximum number of people. We do not plant on private lands or transfer ownership of a tree. Neither do Grow-Trees own the trees. The tree belongs to the community which benefits from its planting. The trees are planted at the places where they are needed the most and where they are assuredly be taken care of by the residents. It includes the degraded buffer zones of Tiger reserves and Wildlife Sanctuaries which helps the communities to get forest produce and have no need to go in the core areas of forests. It will also reduce the man-animal conflicts which are quite frequently seen recently. We also plant trees on common lands of villages with the Panchayats’ consent so that the people there get benefitted by the trees socially as well as financially. We are also plant trees on holy environs which is helpful in keeping the area lucrative enough for the tourism and inculcate the sentiment of care of nature amongst the residents and visitors. The variety of trees planted depends upon agro-climatic conditions and the benefit of those trees in terms of flowers, fruits, fodder, fuel and non-timber forest produce for the local community as well as insects, birds and animals. All trees planted will be species indigenous to the planting site. Our planting partners have won awards for their achievements and are carefully selected by us based on their reputation and track record. We also get our planting sites independently audited after the planting. The report on findings can be shared with the parties if needed. The excerpts of the audit reports are put on the website regularly. We do an internal audit also to check if there is only one tree allotted to one person. While currently the tree plantings are in India, Grow-Trees.com will offer its worldwide customers a choice of countries in Asia, Africa and the Americas wherein to plant trees. Individuals have the convenience of planting trees at one time for anniversaries and birthdays, and their message would be delivered by email on the due dates, or to send the same or different messages to multiple recipients for festivals. We have created an environmentally positive substitute for greeting cards and also for other conventional gifts where people can plant trees while greeting people and offset their carbon emissions with trees. What are cloth washable pads? • have wings and are held in place by snap buttons. They are usually made from absorbent cotton like flannel and can be washed and re­used for many years saving a lot of money. In India, the tradition of using cloth is still the most widespread practice to manage menstrual flow however women are also often uneducated when it comes to hygienic practices. In recent years, MNC’s have recognized the market growth potential for sanitary napkins, and are effectively convincing women and girls through sophisticated marketing efforts that cloth is dirty and the cause of infections and that disposable sanitary napkins are the only product which offers sanitary protection. This is a myth. Cloth pads, when changed regularly (comparable to a disposable sanitary napkin) washed with soap, sun dried and stored in a clean place are a perfectly hygienic way to manage menstruation. Just like our underwear this simple care is all that is required and no special sanitation is needed. In other words, it is our practices of caring for the material rather than the material of cloth which results in health or disease. Cloth washable pads offer a new possibility. They provide an enhancement on the traditional practice of using cloth as typically the cloth women normally use is old, lacks absorbency and does not remain in place. Modern cloth washable pads contain leak-proofing and wings and when rinsed in cold water after use, do not stain. Very useful product & good innovation.This will enable a greater population of medium class women to avail hygienic environment. This will also solve growing environment problems. Hi Mrs. Maya, thanks for the visit, this product will surly help the middle and poor. Also it will make better impact on environment.